The government shutdown has forced the Federal Bureau of Investigation to delay its release of a final request for quote for the ITSSS-2 contract until at least March, according to a Jan. 31 agency announcement. Information Technology Supplies and Support Services, or ITSSS-2, is the focus of this week’s update to Bloomberg Government’s Top 20 Opportunities. The contract will deliver information technology services to the FBI for the next 10 years. According to the FBI announcement, the shutdown “delayed Information Technology Acquisition Unit (ITAU) by more than a month. The previous schedule will be adjusted accordingly.” That schedule, established on Dec. 3, had proposed a final RFQ release on Feb. 1. The predecessor, Information Technology Supplies and Support Services (ITSSS), was competed under a blanket purchase agreement (BPA) on the General Services Administration’s Schedule IT-70. Although the FBI earlier in April 2018 proposed establishing its own stand-alone enterprise-wide contract to compete orders on the follow-on contract, the bureau will continue to use IT-70 for ITSSS-2. According to an April agency announcement, ITSSS-2 would provide such services as agile development; cloud; cybersecurity; operations and maintenance; and telecommunications. The FBI awarded 46 contracts on ITSSS in October 2010. Services under the contract will be structured slightly differently than what was outlined in the stand-alone proposal. According to a Dec. 3 update it will have six tracks, not 12: end-user services; business application services; delivery services; platform services; infrastructure services; and emerging services. The FBI has realigned the tracks to better map to a Technology Business Management Council framework, which chief information officers and chief technology officers generally endorse as a best practice. There will be about 15 to 22 awards per track: 10 to 15 for large businesses, and five to seven for small businesses. The FBI held an industry day in April, which estimated that the total obligations through ITSSS were about $2 billion. Click here for the industry day slides. 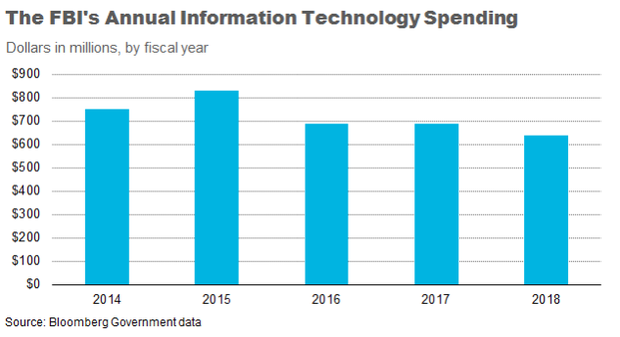 The FBI, the agency responsible for protecting the U.S. from crimes ranging from terrorist attacks, cyberattacks, espionage, and corruption, spends about $718 millionper year on information technology. Once established, it’s likely that most of those orders would flow to ITSSS-2. The majority of spending obligations on the ITSSS vehicle aren’t tagged as being on ITSSS. But there are some ways to get a sense of the type of activity flowing through it. Click here for a list of 864 Schedule IT-70 task orders, totaling $1.6 billion, placed by the FBI with companies that are ITSSS contract holders. The list aggregates post-fiscal 2010 spending obligations that could have been made through ITSSS. Click here for a list of 27 orders totaling $95.6 million. This list also includes FBI contract obligations after fiscal 2010 that went to ITSSS contract holders, but it narrows the view by restricting the results to those that match ITSSS-related keywords. The spending obligations, while limited, have almost certainly been purchased through IT Triple-S.